Max Bemis' new project is a collaboration with his wife Sherri, who fronts Eisley. Bemis talks balancing his family life with his recording one and how marriage has changed his music, but not in the way you think. Calling Max Bemis busy would be an understatement of breathtaking proportions. Sure, he's known well as the neurotic front man of emo kings Say Anything, but being an integral cog in one of the scene's most well oiled machines is only the tip of the iceberg. Bemis co-fronts a side project with Saves the Day's Chris Conley titled Two Tongues, he has penned his own comic book series, titled Polarity, and is currently working on a Spider Man/Magneto story arc for Marvel, and he runs his own Song Shop, in which he writes and records personal songs for fans. Oh, and he's also a happily married man and a new dad. What better way to celebrate such personal triumph than with another new project: Perma. 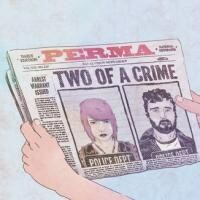 Comprised of Max and his wife Sherri Dupree-Bemis (Eisley), Perma is a love story told by the two people who are living it. Their debut album, Two of a Crime is a real life fairy tale told through charming pop rock, filled with the ups, downs, and quirky personalities of its creators. Don't for a second assume that Bemis' full plate has resulted in lackluster work. Perma's debut may be some of the best material he's ever put out. PopMatters recently had the chance to talk with Bemis about the creation of the project, how he balances his many creative outlets, and how he views his legacy. I know that trading songs back and forth was kind of a starting point for you and Sherri's relationship initially, but when did Perma officially become a real project? Well, we always joked about it being an actual thing, but in a serious way. I don't think we ever intended to not do it, but we were obviously thinking of it more as a flight of fancy than a real band that we had to start writing or recording songs for. I think as we progressed in our individual careers, we both felt a need to do something like Perma and we had the time to do something like Perma. So that's when it went from being this kind of cute inside joke almost to being a real thing. I'm sure having a studio set up inside your home is something that makes it easier to record whenever you feel like it and move at a natural pace. Yeah, this record itself started out as just us fiddling around and making demos, and then we liked the sound of the demos so much that we ended up sprucing them up and those were the first few songs that we recorded for the record. Then we got more serious about writing it and we wrote probably eight more songs, and that's the record. What's the writing process like for you two? Do you take turns or do you schedule time to sit down together and write and record? It's actually really fun. It's the first, or maybe the second time that I've had the dynamic where it's kind of all over the place. Say Anything has always worked a certain way, even when Coby [Linder] was in the band. I would basically write all of the music and parts and changes and then bring it to Coby and he would suggest things and add his touch. But mainly for the lyrics and melody and chords and time changes, that was all me. In this case, we would start with a verse or chorus that Sherri wrote and I would write the bridge, or we would start with a full song that Sherri wrote and I would help tweak it a little bit, or vice versa. It really was all over the map when it came to lyrics and melodies. Sometimes we're singing our own lyrics; sometimes we're singing lyrics that the other person wrote for us. It was just like there were no rules attached and it made it a really fun writing process. A lot of it was attached to just doing so much in the studio, because we have one [at home]. So we'd do the music for a song and then be like, "Oh, we need a verse." So then Sherri would go in the back and write a verse and then come back out. It was just organic. The interesting thing to me about Two of a Crime is that, on the surface, it's this sweet, fun, carefree record, but there's also some really personal stuff on there. It almost feels more personal and revealing than some of your other work. Was that intentional? Yeah, completely. It's a part of me that -- not that I'm hesitant to tap into for Say Anything -- but it's a part that I don't want to oversaturate Say Anything with. Basically, my life is great right now. I love my marriage, I love my kid, I love my relationships. And my relationship to Sherri is something that I want to cover in Say Anything, but I don't want everything to be about that, or I think everyone, including me, would get sick of the whole thing. In terms of Perma, I'm able to delve into it, because it's not just about me, it's about Sherri and I's relationship. I think in the context of singing with someone about a relationship and writing with each other, you have more to say and can dig a little deeper than if you're just writing about yourself endlessly, which is what Say Anything is. That isn't a diss to any band that does only write about their relationship with their significant other or whoever they're involved with, but that's never been our thing. So it was nice to be able to explore different aspects of how I feel about being in a relationship, and maybe that caused some revelations to come out that didn't have the space to do so in Say Anything. A lot of your fan base was introduced to you at time when the content of Say Anything was a bit darker and a bit more cynical lyrically, so I wondered how your fan base as a whole reacts -- do you feel like they've grown with you as you've become a family man and a dad? I've actually been amazed, because the first two songs we released were very much Perma songs. They were love songs -- very sweet. Like you said, they're a little bit cracked and flawed and screwed up and revelatory, but I have been utterly surprised to see no negative feedback on the fact that it is what it is. Not only are people familiar with the fact that Sherri and I are really happily married, because we talk about it all the time and it's very apparent, but I think people were ready to have that aspect of my life explored, from what I can tell at least. It's really gratifying to have people -- both guys and girls -- be drawn to this more idealic representation of what's going on in my heart. You've talked about it being a fun project, but I wondered where you draw the line between it being that and something that might end up taking off and becoming it's own real entity. To be honest, nothing would thrill me more than to have Perma be some kind of huge, ridiculous band that's either as big as Say Anything or bigger in terms of how many people know about the band or come see us. Not for monetary reasons, but because that means I get to spend more time hanging out and writing with my wife. The project is so close to my heart that there are a lot of worse things I can think of than Perma taking off and me getting to sing to Sherri and about Sherri perpetually. That's an appealing thought to me. I think Say Anything has carved a niche right now. Thankfully, I'm in a really good place with Say Anything and I think our fans are in a really good place with Say Anything. We have a great label. We have made clear what we're out to do as a band and people grow with us. It can do its own thing, so anything I do outside of Say Anything doesn't threaten it or undermine it in any way. It's just another thing I get to kind of dig my teeth into and enjoy being a musician. With so many different outlets, I wonder how you go about flipping the switch and decide when it's time to write Say Anything or it's time to write Perma or whatever else. Flipping the switch isn't that hard. For instance, I have a band with Chris Conley of Saves the Day called Two Tongues. As soon as we knew that we were going to write another record, I immediately started writing songs that I knew would be Two Tongues songs. Not Say Anything Songs or Perma songs. I think, thankfully, there's something that each of these projects are involved in at the moment that's really definitive. Maybe it's just in my own head, but I've never written a song and been like, "Oh, what do I use this for?" To be honest, I always have the project in mind. That's just the kind of writer I am -- I don't know if that makes me a sellout, but I don't tend to pick up an acoustic guitar and just kind of strum or sing what comes to mind every day for no reason. To be honest, in this day and age with the way music works, I think a lot of artists are realizing that you can't really afford to rest on your laurels. If you have something cool to offer that's more than one dimensional, then you should go for it. I, as a music fan, when there's a musician that I get attached to, I'll buy anything they put out, whether it's a solo record or playing music with a different band. I can relate to that as a music fan, so I try to offer people who like my music that, so that there's always something out there new. Or at least as much as I can possibly put out. In between the different bands, song shop, the comic book projects you're involved with, and being a dad and a husband, how do you juggle all of that and place the priorities in the proper places? I imagine all of that comes easier to you at this point than it would have five or 10 years ago. Do you feel like there's been a natural maturation in that area? Yeah, completely. I was in a particularly bad place five or 10 years ago and anyone who's in the early 20s or late teens doesn't really know what they're doing and they're just trying to find a foothold in life. So it was all a learning experience and getting married was a big part of that for me. Looking out for someone more than myself and having a baby were obviously an extension of that. You just kind of get pushed into different places in your life and as a person where you're forced to man up, so to speak. That's what happened to me and it's not like I excelled, but I definitely have done enough so that I can continue to grow. Since you're about to head out on tour, I wondered what it's like now that there's a whole family involved. I know you recently did a tour with Say Anything and Eisley and the whole family was there. What has that adjustment been like? I think more than not now, that's always the experience -- that there's someone who's a wife or a husband, whether it's me on an Eisley tour or Sherri on a Say Anything tour or we're touring together. For instance, on this tour, Merriment is the opening act and they're a band on my label that's comprised of two of my siblings-in-law. So they're going to be in the same van as us, and Colin from Merriment's girlfriend is coming to help do merch. Everything is really in the family. We're not necessarily literal family, but I do a lot with the Saves the Day guys and they're very, very close friends. Matt Pryor, who we just signed to Rory Records, took us on our first tour. So I tend to operate within a certain comfort zone when it comes to the people I surround myself with. When someone new comes in who's a good guy or a good girl that I can connect to, that's great. But when it comes to touring and the label and all of that stuff, I feel most comfortable with people I trust and get along with. I just don't really have time to mess around with anyone who annoys me or even just lives a different kind of lifestyle. It doesn't have to be negative, I just have too much going on and I'm too old -- even though I'm 29, I feel like that's too old to be dealing with social situations and professional situations that aren't apt. You're a guy who's been in this scene for quite a while now. You've really made a name for yourself, and as we talked about priorities shifting, I wonder when you look back if there's any particular thing you look at and want to be remembered for or something you want to put your name on, as in, "This is who I am." You know, it's all relative. Anything I've done well, someone else has probably done better, in my eyes. To be honest, if I give myself too much credit for any one contribution to culture, I could probably think of someone who contributed more. But I guess in my own perspective, if we're talking about the evolution of indie rock and the evolution of punk rock and where those scenes converge, I would like to think that we brought a certain sense of neuroticism. Being okay with being completely odd and unquantifiable and analyzing yourself -- almost like Woody Allen or Larry David -- to the whole post-punk thing. I really feel like there was a time when it was completely self-serious. As soon as I say this, I think of bands who didn't do that. My Chemical Romance made a whole huge career out of not taking themselves entirely too seriously. We're not the only ones who did it, but having lyrics be confessional, but not corny. And having lyrics be cathartic, but not dumb. I think that's something that we brought, mostly to the bands we were playing with and to the fans we were playing with. I've seen some bands take it and run with it and I've seen some bands completely ignore it, but it's the one thing I cherish the most about Say Anything. There's a million other bands that made amazing catchy songs and made loud, technical songs, and those parts are cool, but I think what stands the test of time is the oddness and the neuroticism and the self-referential thing. I feel like we kind of dig to that uncomfortable nerve. A lot of people are willing to divulge their feelings about being broken up with, but not a lot of people are willing to divulge their feelings about being a horny, lonely stoner. Or a self-loathing dad. That's what I've noticed and that's why I sometimes have a hard time connecting to certain music. So much of it is a veneer and just this antiquated rock star-ism, where it's like, "You can't dig too deep or they're not going to think you're cool!" I just don't roll that way.